It’s that time of the week again! It’s the Hookin On Hump Day link party for the fiber arts! This party is for those of us into fiber arts like crochet, knit, sewing, felting, embroidery, cross-stitch, crafting with fabric, and anything else related to fabric and yarn! I will choose my favorites each week and feature you here on my blog and on Pinterest. Most of my followers are into crocheting, knitting, and sewing, so it’s sure to drive traffic to your site to link up! 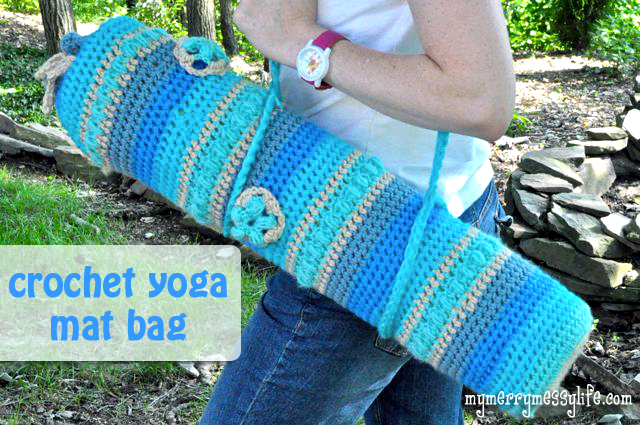 This past week I was busy hookin’ away making a crochet yoga mat bag! This is one of my favorite projects to date. I also posted the pattern for the crochet flower motif, the strap, and a puff stitch tutorial. Plus, I started a giveaway with the Green Moms Network that has been very successful! It’s still going on now until Friday night – you can enter to win 4 100% wool dryer balls and my own homemade organic body butter. All I ask is that you link back to me by either text link https://mymerrymessylife.com or by including the button below, and please visit the link before you so we can really support each other. Thanks! Here are my favorites from last week! Thank you to all who linked up – I really appreciate your support of this party! It helps all of us. Again, it was really hard to pick just one, since there were many creative, beautiful projects. 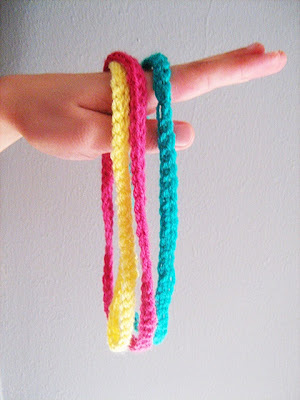 The most clicked on link was Little Things Blogged – Summer Crochet Simple Headband. Love the colors and it’s super easy with a free pattern! The next highest-clicked entry was Hannicraft’s Summer Stripe Handbag. What a gorgeous bag, I can tell she spent tons of time on it! It’s lined with pockets and is as functional as it is beautiful. I just love the idea of barefoot summer sandals like these from Jay’s Boutique, and they are quite easy to make! Wouldn’t they be perfect at a summer barbecue when you don’t feel like wearing shoes? It’s like jewelry for your feet. I will pin all of your projects on my Pinterest Board. Here is your “I’ve Been Featured” button!